Get ready to fall in love. Introducing the darling Crochet Chick pattern. Fun for spring. A great addition for a special Easter basket or even for your office to welcome in Spring. I don’t know what it is but the cheery yellow and orange reminds me of warm, sunnier days–all the things that signal spring is in the air! 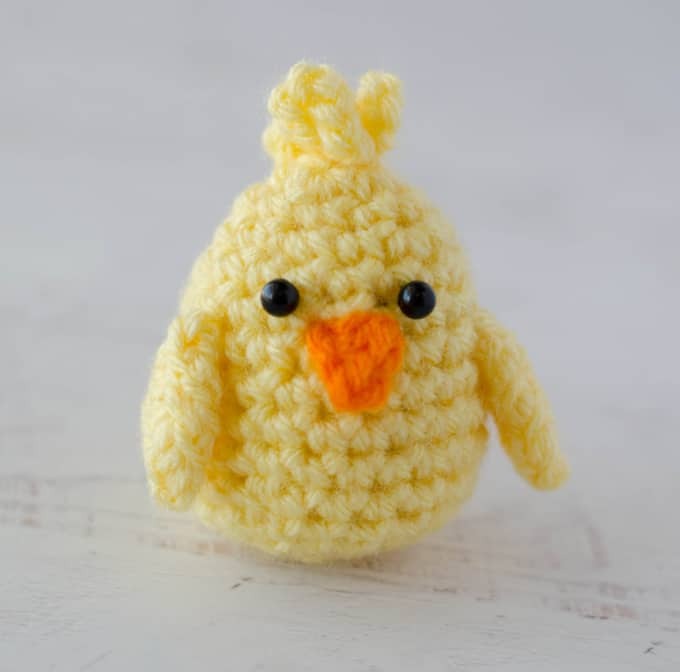 This crochet chick uses the crochet egg pattern. I worked hard to design an egg that would be just-right narrow at the top and then gradually build to chunky, rounded bottom. And who doesn’t love a project that can be worked right from your stash pile! 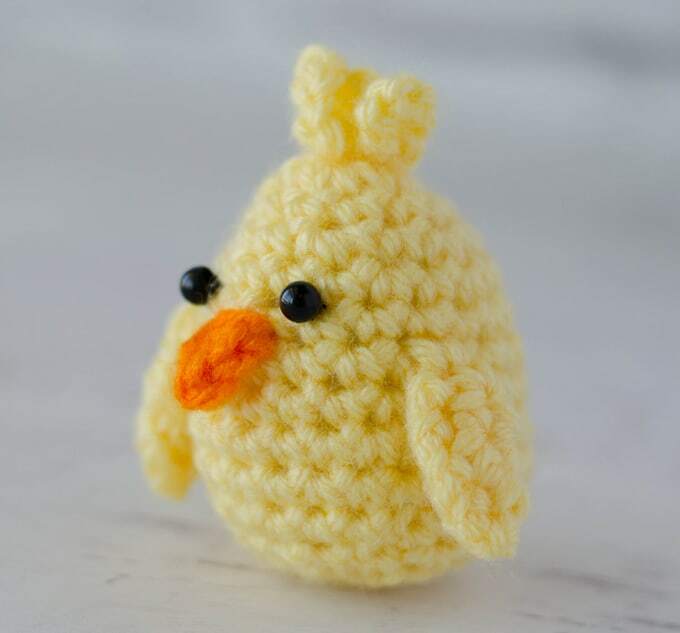 If you love this crochet chick pattern, you might also like to check out these other Easter crochet patterns that are perfect for spring. You can find all our Home Decor Patterns here. 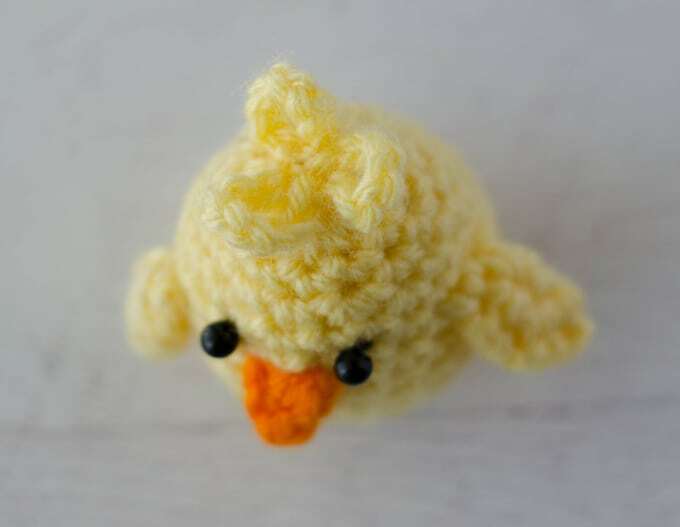 But first .. this little bit of cute crochet chick goodness! Let’s get started! 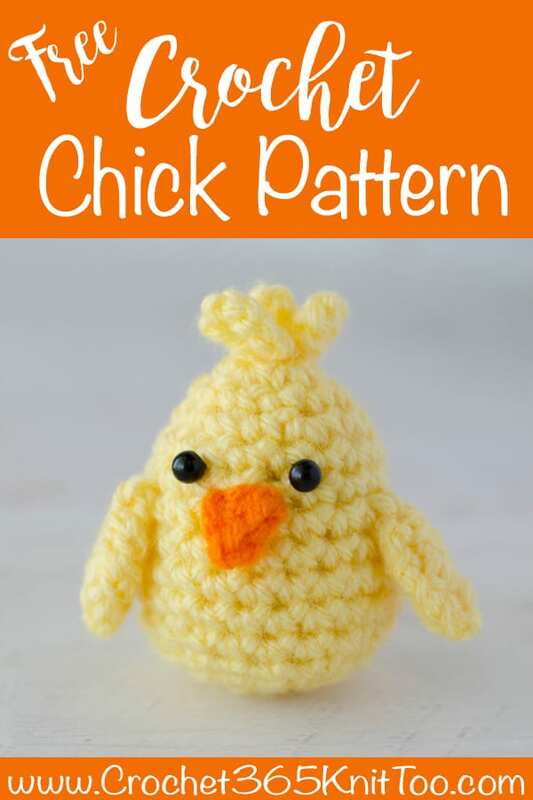 Purchase an ad-free printable version of the Crochet Chick pattern here! Chick is approximately 2.75” tall, excluding the top feathers. R2: *2sc in ea st*, repeat * to * around (12 st). Fasten off, using invisible join, if desired. Fold in half and sew together edges. Place a wing on either side of chick and sew down at the top, leaving the bottom of the wing free. With yellow yarn, attach yarn to top of head with a slip stitch. *Chain 8, sl st to 1st chain. Repeat from * 2 more times. Fasten off and use ends to tack down. With orange yarn, ch 3. Sl st in 2nd ch from hook, hdc in last chain. Fasten off and use starting and ending strands to sew onto chick. Sew button eyes above beak. Weave in any remaining ends. Looking for more Easter patterns? Click here for more Easter patterns! I love seeing your finished projects! If you enjoyed making the Crochet Chick, I’d love to see yours on Instagram, be sure to tag me @crochet365knittoo. If you are on Facebook, stop over to the Crochet 365 Knit Too Facebook page or pop over to the Crochet365KnitToo Club and share a photo! I’d love to see your work! Written pattern copyright Cheryl Bennett 2019, all rights reserved. Please do not reprint or repost this pattern. 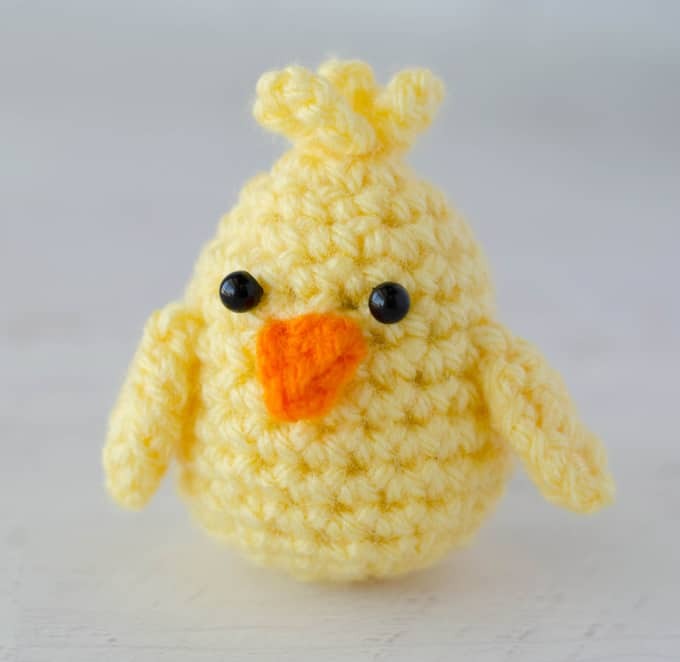 If you would like to share this Crochet Chick Pattern with others, just link to this page. If you’d like to make items for sale from this pattern, please visit my About page for more information.